Why won’t my child eat vegetables or meat? The challenges of picky eating can easily leave you wondering if there is a secret potion or magic wand that successful parents have. There is no magic, but you can adopt an approach that will pretty much give you Merlin status overnight. What is it, you ask? It’s play! But not just getting messy with food. Play that is strategically targeted at helping your child move up the steps to feeding and overcome picky eating. Before we talk about how to play, we must first understand the steps to feeding. The steps to feeding are essential to understanding why your child resists trying new foods. Why do the steps to Eating matter? You probably think that eating (or feeding) is the chewing and swallowing food. This is the finish line. The steps to eating are part of journey needed to successfully try new foods. While some children leap up the steps to feeding, this is often not the case. For specific foods (yes, meat and vegetables), the steps to feeding may be taken much more slowly, with movement up and down as your child learns to accept the new food. For some children, the sensory experience of eating including texture, taste and visual appearance of food require careful attention to these steps. Isn’t exposure to new foods the key step? You’ve probably heard the statement that it will take your child 10-20 exposures to a food before she will try it (or eat it). The concept of exposure is important, as a child can’t learn to like a food that isn’t offered. However, simply focusing on exposure doesn’t tell the whole story. The key effect of exposure is helping your child move up the steps to feeding. Eating is much more than chewing and swallowing. It involves physical skills, nerves and sensory experiences. When we take a moment and understand the journey involved in developing feeding skills, we can better help our child succeed. Tolerates – The steps to eating begins when your child accepts the food in her environment. This means that the food can be placed on the table, on place mat near plate, and eventually on her plate. When you place a food on your child’s plate and she hasn’t yet reached comfort with this food, you immediately see the result which can be crying, throwing the food or shoving the plate on floor. Interacts – The next major step toward feeding is interacting with a food. This includes using another object (usually a food or utensil) to touch a food. Assisting with serving or preparing foods is an example. Note that this step doesn’t include touching a food with her fingers or hands. It is necessary to first become comfortable interacting at a distance (using another object). Touch/Smell – Using a hand or finger to touch or smell food from a utensil or plate. It may also be touching the food a part of the body (not hands). Having a physical interaction with the food requires a significant level or comfort interacting with the food. Taste – Food begins to interact with the mouth and may include licking or touching it to the teeth. A bite may be taken and then spit out. This step may result in steps back down, as a child may be surprised by the sensory experience. A decreased tolerance to the food or comfort interacting may be occur. Eating – The final step includes biting, chewing and swallowing pieces of the food independently. This step may be achieved transiently with up and down movement for the same food. It is normal for children to have variable acceptance of a food even once they have started eating it. When feeding your child, you should be constantly evaluating her position on the steps for each food. This is particularly important for new foods or foods that are typically less tolerated, such as meat or vegetables. By watching your child’s response, you can determine where she is on the steps to eating and ensure that you are not creating pressure (and causing resistance) with your approach. What Does Play Have to Do with Eating? Play is the language your young child understands best. She is curious about the world around her and has a blossoming sense of imagination. Eating and feeding through the eyes of a child is an extension of play. For parents, the goal is eating. This disconnect can create what is often described as picky eating behaviors. Play allows you to engage your child where she is on the steps to feeding. By leveraging natural curiosity and using food as part of play scheme, you can move her up the steps. It is a dance with you keenly evaluating her comfort level and engagement with the play scheme. It is important to remember that food play doesn’t have to be a food fight or even especially messy. Food play leverages curiosity to reduce resistance to a new food and move your child up the steps to eating. In this video, you will see an example of using food play to move up the steps to feeding. This play scheme centers around sweet potato soup, a new and non-preferred food. It is made with curry, cinnamon and has very bright orange color. Expecting a child to take a bite of a new and unfamiliar food is unrealistic and would likely result in both resistance and very little success. Step 1: Offered carrot sticks (a preferred food) while finishing heating the soup. Step 2: Initiated the play scheme. Started using a carrot stick as a paintbrush to draw letters on a plate. He joined in and started playing a favorite game that is usually done with his crayons. This familiar activity reduced his apprehension about the new food. Note that in this video, he is not comfortable with the food yet. He wasn’t interested in sitting in his seat and is approaching the play from a distance. Also, note the reaction when he realizes that some soup is on his shirt. This moved him from interacts to touches on the steps to eating, and you can see he was uncomfortable with this jump. I offered some reassurance and let him know we would wipe it off. Step 2: Brought pasta pieces (a preferred food) to table. Transitioned to play scheme that involved trying to hide the pasta pieces. This very simple game was highly effective, and you can see how much more comfortable he now is with the food and is sitting comfortably in his chair. The food is close enough he is getting to smell the soup. This play scheme didn’t result in a bite being taken of the soup, however, he successfully moved up the steps to feeding from tolerating all the way to touch and smell. For the first time exposed to the food, this is significant progress. With subsequent exposures and careful attention to his response and position on steps, he will successfully try this food. Using play eliminates the need to bribe, reward or pressure your child to try the food. Play leverages natural curiosity and is developmentally appropriate. Exposing your child to new foods using play schemes that are tailored to their current position on the steps to eating is highly effective. This approach to helping picky eaters is called play-based feeding therapy. A pediatric dietitian with advanced skills in creating and implementing play schemes can help support you in successfully implementing this approach. Thank you! Check your email for link to download. Struggling to understand why your two-year-old won’t eat? This article doesn’t contain a magic wand with the power to get your child to eat when they refuse. What is does is far more useful. You will learn the root cause of your child’s behavior and what to do to help your child eat better. Is it normal for children not to eat? First, let’s clear the air on a common misconception. Most of the time, children that refuse to eat are labeled with negative terms such as bratty or difficult. This frames the challenges with eating as a behavior problem. The issue is that most children that struggle to eat don’t have a behavioral issue. The behaviors such as refusing to sit at the table, throwing food, gagging or tantrums are really symptoms. If you are the parent of a toddler, eating and meals can feel like a roller coaster. The developmental changes your child is experiencing along with a normal slow down in growth contribute to food refusal. Neophobia and picky eating are a hallmark of the toddler years. Read this Toddler Feeding Guide for a comprehensive look at nutrient requirements, portion sizes and best practices. For even more help, this article offers specific ideas about what to feed your toddler. No matter the age of your child, once you understand the underlying cause and implement strategies, the behaviors and food refusal can resolve. Meals can be pleasant and important quality family time. Helping your child eat better starts with understanding common reasons why children refuse to eat. If your child turns his nose up a food or an entire meal, our natural response is to offer encouragement. The reality is that our good intentions contribute to picky eating. Pressure creates stress for your child and stress promotes the release of adrenaline. Adrenaline is a hormone that helps us be more focused and respond with a fight or flight response. Unfortunately, it also suppresses appetite. It is easy for meal times to become a pressure cooker when your child is refusing to eat. There can be bribery, lectures about the importance of nutrition, and threats of going to bed hungry. Even subtle pressure can create stress for your child, especially when there is a desire to please you. While the goal of these well-intended efforts is to get your child to eat, instead they are turning off the appetite switch for your child. To help your child eat better, skip the pressure at meals. Following this guide will help you establish a relaxed and fun mealtime routine. With hectic schedules and convenient snack foods for kids available in abundance, it’s common for kids to graze throughout the day. This leads to meals with little or no appetite, and then grazing again between meals. It can be a cycle that can feel tough to break. You may worry if your child doesn’t eat well at a meal and want to offer food. Your child may also demand snacks and it can feel difficult to manage the inevitable tantrums that may arise if snacks on demand are eliminated. Implementing a schedule for meals and snacks is essential to creating an environment for success. Use this step-by-step approach to make a successful transition. If you find that your child prefers a particular food texture or taste, you can benefit from a better understanding the sensory elements of eating. Eating is far more than the physical action of putting food in your mouth, chewing and swallowing. In addition, there are an incredible array of sensory experiences your child must integrate and process as part of the eating experience. This might be touching a “slimy” vegetable or processing the smell of roasted cauliflower or Brussels sprouts. The response your child has to the sensory experiences of food are most likely normal but may be different from another child the same age or even older siblings. If your child eats only a single texture or you observe difficultly with chewing or swallowing, talk to pediatrician about your concerns. One strategy that is particularly effective for children that are highly particular about food texture, flavor and refuse to eat foods, is food chaining. This highly individualized approach to selecting foods creates a chain of similar food and over time expanding the number of foods accepted by your child. Preparing a special food for your child in an effort to thwart food refusal or to ensure that something is eaten is a trap that many parents fall into. You might be thinking that your child refuses to eat anything but a handful of foods and that none of these foods are on your list of dinner ideas for the family. These preferred foods are not your opponent, they are your secret weapon. The key to eliminating short order cooking is to include a preferred food at meals and snacks. A preferred food is one that your child eats at least 50% of the time when offered. It doesn’t mean that it is a favorite food, just one that is usually accepted. When you include a preferred food with the meal (even if it’s chips! ), your child has the opportunity to be exposed to other foods in a low-pressure way. He isn’t worried that there is nothing on the table that he can eat. Using a preferred food approach is incredibly powerful both because it eliminates the need to pressure your child to eat (there is a food he can fill up on available) and provides consistent exposure to new foods. This strategy and how to implement is described in detail here. How to get your child to eat when they refuse is about understanding the root cause of the problem. Focusing on the negative behaviors creates misguided efforts and does little to resolve the issue. Join my email list to learn the top 3 mealtime mistakes that contribute to picky eating and what to do instead. You’ll receive an exclusive “Mistake Free Mealtimes” worksheet to identify exactly what you need to change and an implementation plan to help you get started. If your experience as the parent of a picky eater is like mine, you're an expert on what doesn't work. You've tried just about everything and NOTHING WORKS! So why spend time reminding you of what doesn't work? Don't worry, I'm not here to scold you or tell you that what you've done has caused picky eating or that you are to blame. If you remember, even as an expert in pediatric nutrition, I had a huge serving of humble pie with my older (and VERY picky) son. The reason I'm sharing with you what doesn't work is to help you start to peel back the stress and struggle you currently experience around feeding your child. In order to turn around picky eating, you need to be given permission to let go. What we tend to focus on is getting our child to eat certain foods or food groups. But the truth is, raising a happy, healthy eater is far more than eating bites of green vegetables or meat. Our most important job is to help our child have a healthy relationship with food. This means that they are able to choose foods they enjoy (yes, even vegetables and meat) and eat them in amounts they find satisfying (not a required amount to have dessert or their iPad). The problem is that our well-intended efforts to help our picky eater can be making things worse. Here are the three most common mistakes parents make that sabotage a healthy relationship with food and contribute to picky eating. The good news is that these mistakes are easy to fix and that most families see a huge improvement in their child's eating when they take specific actions to address these three areas. What's wrong with cheering for a bite of broccoli or requiring a bite of a certain food in order to have dessert? Does pressure work? ….yes, well sort-of…. If getting your child to consume the correct number of vegetables each day is the goal, then you’ve hit the mark. However, research shows that pressure has effects that are less desirable, too. Children may eat a food under pressure, but are less likely to prefer the food. Pressure creates a short-term win, but creates a long-term obstacle to helping your child have a healthy relationship with food. What this means is that we must keep a long term outlook and provide no-pressure opportunities to try foods (including vegetables). This means serving them at meals and snacks and keeping the response neutral. No need to cheer a bite of veggies anymore than we would a cookie. Pressure can also come in the form of a desire to please you. Food is just food. Teaching our children to be competent eaters and helping them have a healthy relationship with food is a long term goal. It doesn’t have the same immediate satisfaction of seeing a bite of vegetables consumed. I know it is hard to keep things in perspective when veggies have been on refuse “repeat." You may fear that your child will NEVER eat vegetables without pressure. However, will your child learn to enjoy eating vegetables if it is learned under pressure? Research says no! The key to a successful, positive environment for meals is to NOT pressure your child to eat. When you apply pressure (even subtle pressure), you create stress for both your child and you, and contribute to picky eating behaviors. To learn no pressure ways to help your picky eater, check out this article I wrote on the topic. Does your child eat on a schedule? A feeding schedule helps your child eat better. Why? Children that graze throughout the day have a higher incidence of picky eating. One of the first things I talk with my clients with young kids about, is the family’s schedule for meals and snacks. With the hectic nature of life, it’s easy lack needed routine. A common mistake I see parents make is offering a snack after a meal when they are concerned their child didn’t eat well. This approach can contribute to picky eating behaviors. It can also make it more difficult for your child to develop an ability to recognize and respond to hunger and satiety cues. If you remember, our goal is to help our child develop a healthy relationship with food. This means fostering the ability to respond to hunger and satiety. Picky eating is often dramatically reduced when a schedule is implemented. If you are struggling to develop and stick to a feeding schedule, this article provides a 5-step plan to implement a schedule. But he won't eat anything else! If you find yourself in the situation of preparing a special food or meal for your picky eater, you're not alone! Short order cooking is one of the most common ways we cope with picky eating. Typically out of sheer exhaustion and concern for our child, we get into a routine of preparing a separate meal or food. There is nothing wrong with serving your child a preferred food at meals. The prior statement is really important and a huge block that prevents many parents from making real progress with helping their picky eater. I'm going to state it again. There is nothing wrong with serving your child a preferred food at meals. In fact, every meal and snack you serve to your child should include a preferred food. Does this mean that you have permission to serve pasta, chips, macaroni and cheese or breaded chicken bites with every meal? Sort of... Let me explain. Stick with me on this one as it will take a bit of background information. Family meals are the building blocks for raising a happy, healthy eater. They give your child the opportunity to be exposed to new foods, you teach through role modeling food choices, and have quality time for conversation and connection. As we learned from mistakes #1 and 2, having no-pressure meals and a schedule for meals and snacks are essential prerequisites for successful family meals. Let's revisit the the topic of preferred foods. Meals should ALWAYS include one of your child's preferred foods. The key however, is to serve this food as part of the family meal not as a separate food/meal for your picky eater. The expectation with family meals is not that your child will eat all the food on his/her plate or even take a taste or smell. Resist the urge to pressure your child. Remember that the key to a successful, positive environment for meals is to NOT pressure your child to eat. For some children, it is necessary to use a divided plate or put new foods on a separate plate or place mat and slowly work up to having new foods on the same plate. I recommend serving meals family style as it gives your child a chance for more exposure to new foods. By serving their own food (even children as young as 2 can participate in serving food), children have the opportunity to see, smell and interact with new foods. Over time and with repeated exposure and role modeling, your child will learn to eat new foods. The key to avoiding mistake #3 of cooking a separate meal or being a short order cook is to prepare and plan meals that ALWAYS include a preferred food. This article offers even more insight on how to end short order cooking. By exposing your child to new foods, creating a no pressure environment and a using a consistent schedule, you will find that your picky eater will begin to explore new foods and flavors. If this sounds like it won't work for your child, I challenge you to give it a try for 2 weeks. You will be surprised by the dramatic changes you'll see in your child. What will probably shock you even more is how much less stress YOU will experience related to meals. If you are ready to make changes that can help your picky eater, but aren't quite sure how to get started, book a complimentary discovery call where I can answer your questions and offer you personalized recommendations. 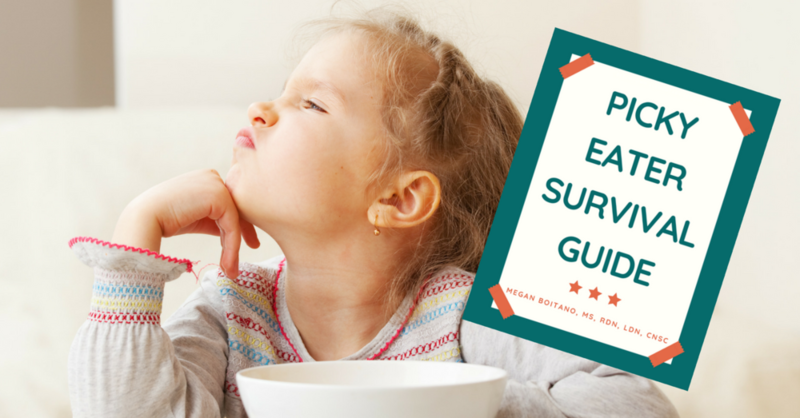 You can raise a happy, healthy eater without doubt and struggle! Thank you! Please check your email for download link. Your picky eater refuses to eat other foods and you’re left with the daily duty of preparing one of an ever-shrinking list of accepted foods. If you are ready to serving a separate meal and feeling like a short order cook, use this approach to plan and serve a single, family meal. When researching preschools, asking the right questions about food and meal time environment is important. The attitudes, beliefs and opinions of center staff will impact your child’s food preferences and food choices. There are a wealth of educational podcasts aimed at kids. They are engaging, funny, and as a parent I enjoy learning and laughing with my children. While answering questions like "Why is milk white?" or "How to make bread?" isn't a magic bullet, it can help to build curiosity about food. For younger children (ages 3 and under), podcasts with plentiful use of songs, silly sounds and short stories are a great option. Older kids enjoy those that answer questions and explore science. Some of my favorites are listed below with some personal insight about how they can help to foster conversation. VPR But Why, November 22, 2016: Why Do We Like to Eat Certain Foods? This episode is perfect for science lovers and very curious kids. It explores the sense of taste from food, brain and chemistry angles. Experts answer questions submitted by kids and offer a number of fun activities to test your own sense of taste. My favorite part about this episode is when one of the experts shares "if you don't like broccoli then you shouldn't eat it." My picky eater became excited, jumping out of his seat that he now had "real ammunition" against eating broccoli. Fast forward about ten minutes in the podcast when a different expert was addressing why flavor preferences vary with different cultures. She focused on repeated exposures to foods creating a tolerance and affinity for certain flavors. My son then stated "that's what happened with broccoli." It is now a vegetable that he eats regularly although he is quick to share that he likes ice cream more. This episode explores what it means to eat healthy. It tells a number of stories that will resonate with kids. For example, getting asked to eat broccoli before being allowed to have another piece of pizza or eating so much cake at a party, that you start to feel sick and have to leave and miss the fun. The style is very engaging and it does a great job of using different voices and background music. I love the storytelling element which offers a natural transition into asking your child to share his own stories. You might be surprised at the observations and knowledge that your child has about food and eating. The general message is "it's all about balance." At the end of the episode you can transition into a great conversation with your child about making healthy food choices. This is a fun, song-based episode that has a healthy dose of silly. It is perfect for toddler and preschool age kids. The episode begins with the ABCs of fruit and then some fun audio of kids talking about fruits and answering silly questions. While there isn't a strong educational element, there is an engaging conversation by one of hosts at the end of the episode. She tries a mulberry and shares that she really didn't like it. However, the focus was "at least I tried it!" This episode was embraced by my toddler and we ad lib during the episode with out our fruit names and silly sounds. You might find that your little one finds the hosts to be an overdose of silly! But Why, July 7, 2017 How Do You Make Bread? But Why, June 22, 2018 Why is Milk White? Podcasts are a great way to strike up conversations with your picky eater about food in a no pressure and fun way. You might be surprised what your learn and I'm pretty sure you'll get a few belly laughs, too! Sign up with your email address to receive new posts delivered directly to your inbox. Forcing, bargaining and encouragement are recipes for mealtime battles. This leads to anxiety for parents and stress. Sound familiar? You may be thinking, but I’ve tried every approach to get my child to try new foods. If I serve the foods I want my child to eat, he ignores or refuses them.